Is there a universal biolinguistic disposition for the development of `basic' colour words? This question has been a subject of debate since Brent Berlin and Paul Kay's Basic Color Terms: Their Universality and Evolution was published in 1969. Naming the Rainbow is the first extended study of this debate. 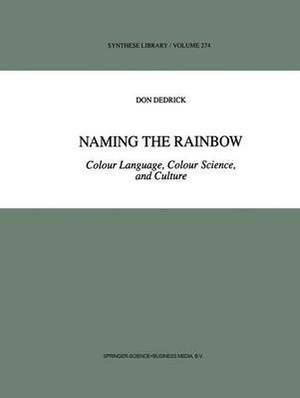 The author describes and criticizes empirically and conceptually unified models of colour naming that relate basic colour terms directly to perceptual and ultimately to physiological facts, arguing that this strategy has overlooked the cognitive dimension of colour naming. He proposes a psychosemantics for basic colour terms which is sensitive to cultural difference and to the nature and structure of non-linguistic experience. Audience: Contemporary colour naming research is radically interdisciplinary and Naming the Rainbow will be of interest to philosophers, psychologists, anthropologists, and cognitive scientists concerned with: biological constraints on cognition and categorization; problems inherent in cross-cultural and in interdisciplinary science; the nature and extent of cultural relativism.